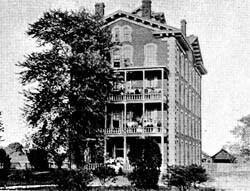 Shaw University, founded in Raleigh in 1865, was the first African American institution of higher learning in the South and one of the first in the nation. The university had its beginnings in December 1865, when Henry Martin Tupper, a white educator from Monson, Mass., started a class in theology for the purpose of teaching former slaves how to read and interpret the Bible. From this class evolved the Raleigh Institute (1866), later changed to Shaw Collegiate Institute (1870) and finally incorporated as Shaw University (1875). The school was named for its foremost benefactor, Elijah Shaw of Wales, Mass. The private, Baptist-affiliated liberal arts institute has always been open to both men and women. This coeducational status was assured with the construction in 1873 of Estey Hall, the first dormitory in the nation devoted exclusively to housing African American women. Shaw University graduated its first college class in 1878, its first medical school class in 1882, its first law class in 1890, and its first pharmacy class in 1893. The school also had a normal (high school) department, which was changed to the Education Department in 1909. With the discontinuation of the normal department and professional schools (between 1909 and 1926), Shaw became the first African American institution in the South to be devoted exclusively to college and theological work. Shaw has provided North Carolina with many educational leaders. North Carolina Central University, Elizabeth City State University, and Fayetteville State University were all founded by Shaw graduates, and North Carolina Agricultural and Technical State University was housed at Shaw during its first year of operation. 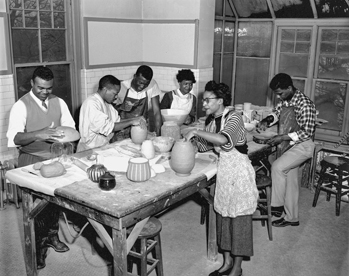 Shaw also developed one of the first black studies programs in the country. In the early 2000s Shaw University enrolled more than 2,400 students in liberal arts and specialized degree programs. It has a strong international studies program, and its Center for Alternative Programs of Education allows students an opportunity to pursue academic degrees through independent study, flexible course scheduling, and credit for prior learning experiences. Wilmoth A. Carter, Shaw's Universe (1973). Clara Barnes Jenkins, "A Historical Study of Shaw University" (Ph.D. diss., University of Pittsburgh, 1965). Joseph L. Peacock, "Our Colleges-Shaw University," Opportunity 1 (March 1923). Estey Hall, Shaw University, Raleigh, NC, c.1873. From the General Negative Collection, North Carolina State Archives, call #: N.68.10.44. Available from http://www.flickr.com/photos/north-carolina-state-archives/2431088849/ (accessed November 14, 2012). I'm writing a historically based novel. My main character attends Shaw University in 1936. I'm wondering what degree programs were offered at that time? Specifically Engineering? There are a lot of pages here, but since you are immersed in this subject, I think you will not find it tedious to go through. Best of luck with your book. I am a professor of chemistry and teach chemistry in universities in Connecticut. I want to know if there is an opening for me in your school. I can teach any course in chemistry. I will send you my resume if you want. What would be the exact amount of money it would cost to be a student at Shaw University? How can i sign up for a scholarship? Here is a link to the Admissions page on the Shaw University website -- http://www.shawu.edu/Admissions/. That should help you find information about the cost of applying to Shaw and other admissions information.